This is a strange hybrid design that proves just how difficult it can be to place a chair into a rational typography but it is also a very good example of how a new design can use some earlier features but combine those forms or technical details of construction with new ideas to create what should be seen as a transitional form. At the front and seat, this chair follows fairly closely the accepted form of the Chippendale type with a straight front to the front rail of the seat in plan but with a pronounced hollow. The seat itself is not upholstered although the museum catalogue suggests that when they acquired the chair it had a loose cushion although there is no indication if that is original or was added later for more comfort. The seat itself is plywood set down into a rebate in the frame of the seat. The front rail and side rails of the seat are housed into the top of the front legs but this is given emphasis by forming a block that projects slightly forward of the rails and by being deeper than the rails and undercut where the leg below the block is turned. The outer corner of this block is rounded and the foot of the front legs are turned to form curious bulb-shaped feet - a ball shape would have a sharper shoulder. There are straight stretchers running back from the front to the back legs, with a conventional section - thinner than they are deep with rounded top and bottom - but there is no cross rail and no stretcher between the back legs that are both common in a heavier or more robust Chippendale type chair. But it is the back of the chair that differs most from the conventional form. The back legs are taken up to support the back rest and are curved to taper out from the seat - both at the bottom and at the top - but rather than being square in cross section are round and terminate with a rounded top more common on chairs by Hans Wegner. The back rest is a ladder with four slats but with an extravagant wave shape that is pierced in the centre with a long gash this is certainly neither a Shaker style chair nor a country chair. The arms of the chair are equally extravagant with a pronounced upward sweep from the back, where they are housed into the uprights of the back rest, to the rounded front that forms a hand rest if the hands are turned palm down and thumbs in before standing up. They are supported by tapered uprights set in from the end of the arm rest and set into the top of the seat half way along the side rail and are bent in a double curve that anticipates the arm supports of the later Y or Wishbone Chair by Hans Wegner. An example by Ole Wanscher of a traditional or conservative design for a chair appropriate for a formal dining room. Made by the cabinetmakers A J Iversen who produced a number of variations on the design and in other exotic woods including rosewood and walnut. With sharp shoulders to the joins of the frame and using a fine grained wood the design is strong enough to omit the stretchers but otherwise this is another variation on the Chippendale / Red Chair type. Note the fine bead that is taken around the edge of the elements of the back rest - including the cross pieces of the double X. The back uprights are reduced in thickness above the seat with a small elegant shoulder on the inner side and the leather of the seat has a sharp sewn edge ... all high-quality work from an exemplary cabinetmaker. 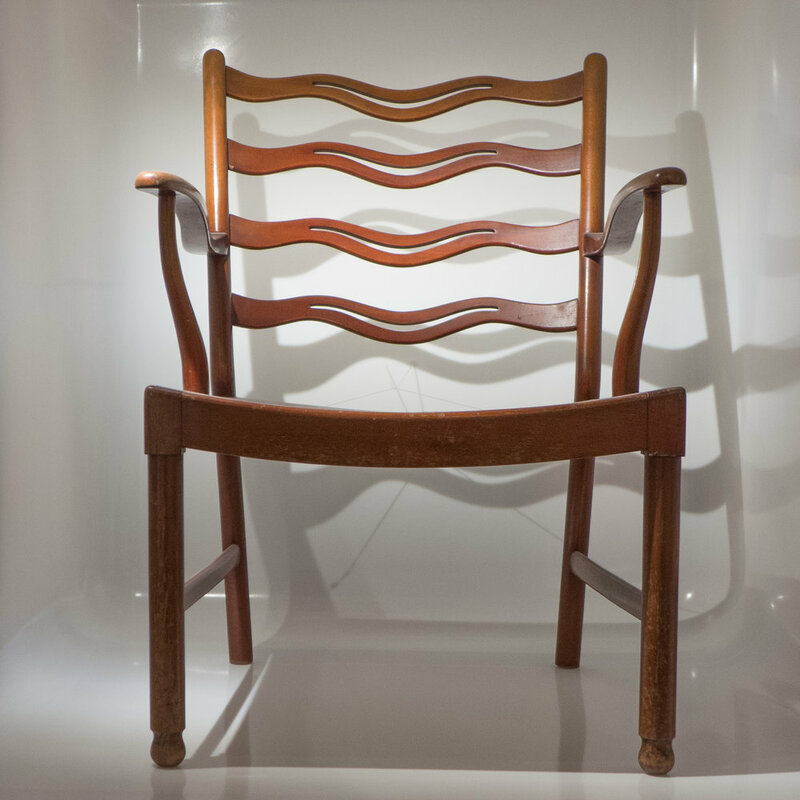 A version of the chair from 1942 in mahogany with the same double X pattern across the back has a rather lighter and simpler and conventional frame to the back, rather than the cross piece, but has stretchers. Ole Wanscher was 18 months younger than Arne Jacobsen but his furniture represents a rather different and more conventional or traditional aspect of Danish mid-century design and his work shows just how difficult it is to use general terms such as modern with any sense of a precise definition. Much of Wanscher's furniture, particularly dining chairs, are conservative and perhaps best described as revival or possibly even as neo-classical survival having much more in common with chairs of about 1800 than with work by Jacobsen. But that moves into an area of making subjective judgements about a design to try and decide if something captures a general style of a period - so follows a contemporary trend - or is truly innovative - taking a form or technique or material in a new direction that influences others and sets what will be popular next - or is unique - with a design that owes little to precedent but with few other designers following. 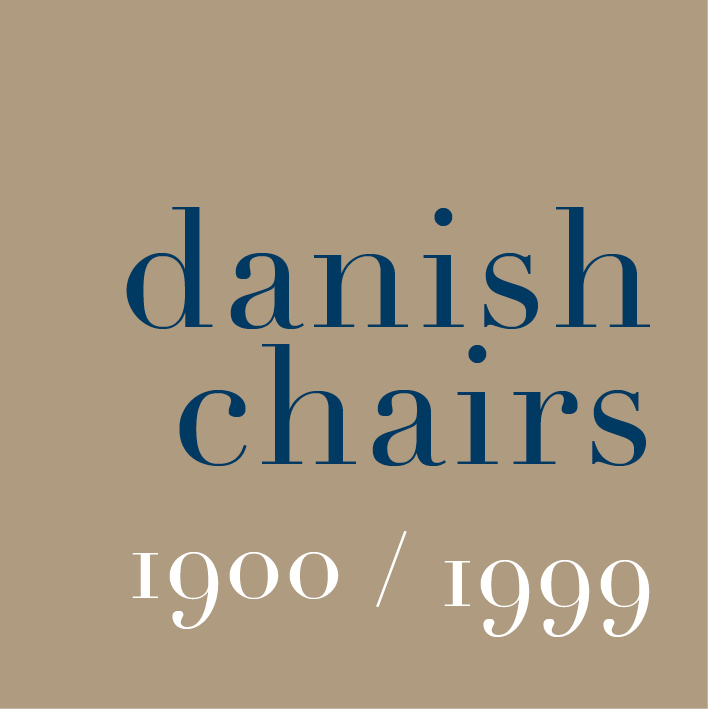 In terms of being transitional, it is difficult to see Wanscher himself producing the Colonial Chair of 1949 without intermediate steps and here, with the Ladderback Chair, Wanscher was establishing a relatively new type for modern chairs … a wide low easy chair in wood that was not upholstered.